The Screaming Pope: Are You a 100 Lb Weakling? Have you spent your whole life wanting to be stronger, smarter and more desirable than you are? Are you always underachieving or performing, in your own eyes, simply because you have placed yourself in an arena of those who are stronger, smarter or more desirable than (or perhaps who you erroneously deem to possess talents in which you are lacking)? Do you feel underappreciated in literally every endeavor in which you perform from the bedroom, to the office, to the social circuit? Women who grew up reading Cosmopolitan might remember many of the self-improvement programs offered to those who were dissatisfied with their lot and then there were the famed “Are You a 100 Lb Weakling?" ads which populated the back pages of comics in which before and after shots showed what could happen if men followed a simple program. 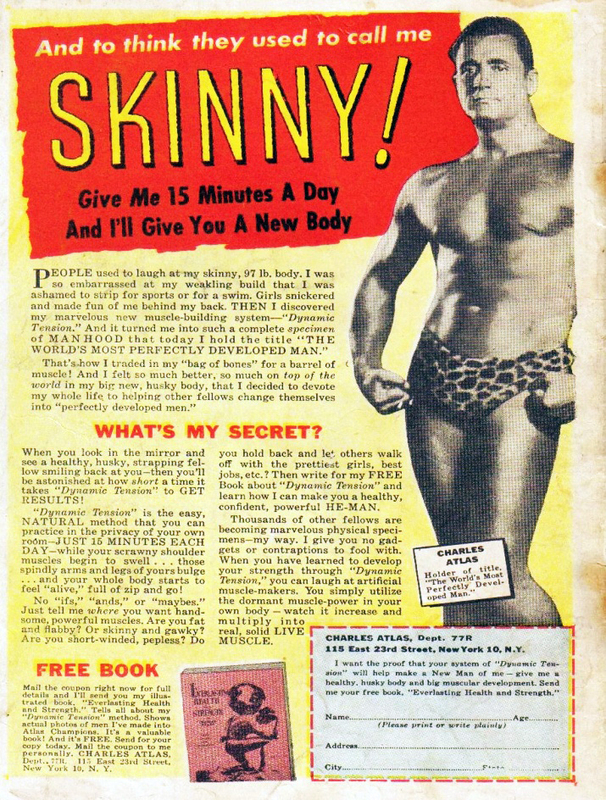 Characters who looked like Kafka’s “Hunger Artist” were magically transformed into hulking body builders of whom the legendary Jack LaLane and Charles Atlas were two of the most preeminent examples. Weightlifting is a discipline where progress is easily calibrated. The realms of intelligence, creativity and even desirability tend to be more diffult to tally. Sometimes it’s simply a matter of being challenged in the area of self-conception. There’s a place for everybody on the food chain. The problem is that some folks aren’t content with their lot in life. There's a fine line between striving and self-hatred. There are those for whom there's no such thing as a goal. No matter what it is they have, the want more and better. They marry again and again searching for a happiness that perpetually eludes them. They want bigger muscles even when they’ve succeeded in becoming an Arnold Schwarzenegger look-a-like or they suddenly decide they want no muscles at all and prefer to look like a sinewy marathon runner. They're constantly caught between a rock and a hard place and end like supernovas that send out their brightest light when they begin to explode.